After a quick go 'round with the universal driver again, the system would not take any setting beyond 640 X 480 @ 4 bits. This tool dumps mode tabes and other very useful info from your videocard. This helps me find an answer. Need to get to my other machine for the test: We'll send the output to you before the end of the day (Western US). Should've hit your inbox by now . . .
to be most helpful when running DOS stuff like INFOVBE.EXE. Just a little thing; but it makes life that much smoother . . .
Don't know if it's news to anyone, but it might shed some light on the issue. Yes, like most other things with these Wintel computers, we spend more time working around bugs than we do building good, clean code for the programs which we make. For the record, I bought my system new just a few months ago, and this problem with the Intel BIOS was still there -- Intel isn't going to change this characteristic with this line of chips anytime soon. THEY'RE STILL MAKING THEM THIS WAY. And, to make things worse, it seems as though the BIOS updates don't work to solve this problem most of the time; which is why the Linux/X-Windows folks simply built workarounds for the video drivers that they use to accomodate these chips. So, until we have a code patch for your universal driver, there will be hundreds of thousands (millions?) of new and older computers with this chipset which never will be able to effectively use VBEMP, or WinBuilder for that matter. A pretty serious situation, if you ask me . . .
Great talking with you, and good luck in your work putting this together! The current (nativepe) scripts use the universal NT 5.1 / 5.2 video driver, and it worked well in tests on real (old) hardware. This is really something I was happy to include in my builds!! BTW, your motherboard is a product of Intel: http://www.intel.com...board/index.htm or it has an Intel's chipset ??? It is a different situation, if you understand me. 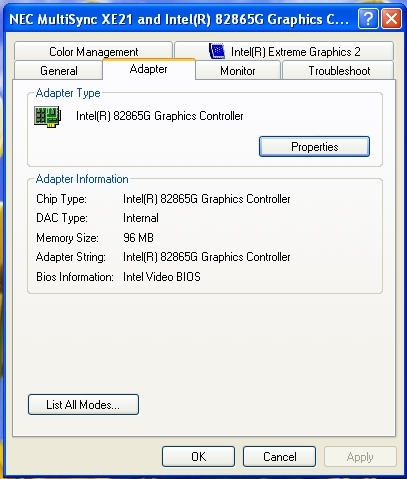 If your motherboard not maked by Intel, Intel does not respond for BIOS problems. Would this driver work to overcome the Intel chipset bottleneck which we've encountered in this post? If so, do you have a script available for this driver which I can grab and put into my build of LiveXP??? Try a fresh nativeEx_barebone download and build a CD. Maybe your issue also depended on my PNP troubles.